Free pregnancy charts to watch your pregnancy progress! Chart dozens of pregnancy symptoms and changes you experience every day throughout your pregnancy, along with charting your pregnancy weight gain. 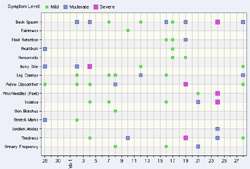 See an overview of your pregnancy with multi-month pregnancy charts, or zoom in down to the day! Charting your pregnancy is simple! Use MyMonthlyCycles free pregnancy calendar to easily track your pregnancy symptoms and weight. Then instantly view your pregnancy charts. Not a member? Join Now! and start using our free pregnancy tracker and pregnancy charts.